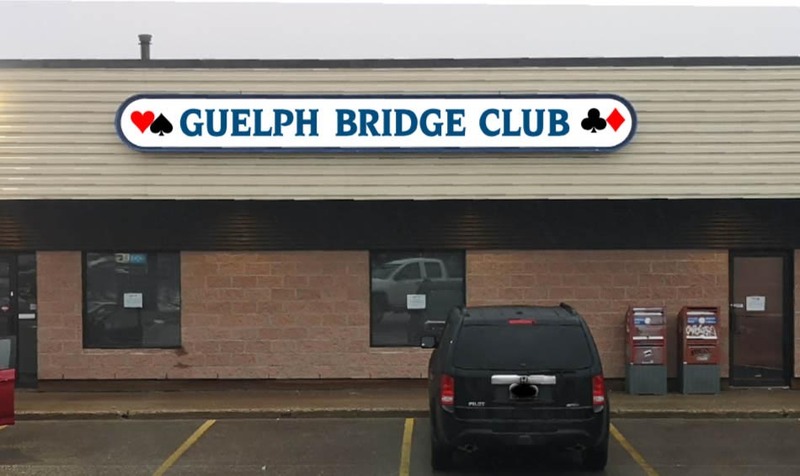 Guelph Bridge Club is a non-profit, membership-run club serving the bridge needs of Guelph and surrounding communities. LEARN, PLAY and ENJOY the many facets of the world's greatest card game! We have games and lessons for players of all levels. Barbara Seagram will be giving a workshop at the club on Sat. May 11th. Details are available here. There is a limit of 60 people for each of the two sessions. To register for Barbara Seagram's Workshop, please click here. To read the information about shuttles to the club, please click here. Thank you to the many members who came to the open house at the potential new location at Grange and Victoria. The location is about 3000 square feet and has ample free parking. To view a photo of the building, please click here. All of the regular sanctioned games during the week of May 6 - 10 will be part of the District 2 Sectional Tournament at the Club. Silver points will be awarded for all of these games. Table fees will increase by $2 for each of these games. Additional parking spaces are now available near the club. If you have any questions, please call Lynn Campbell 519-823-4514. 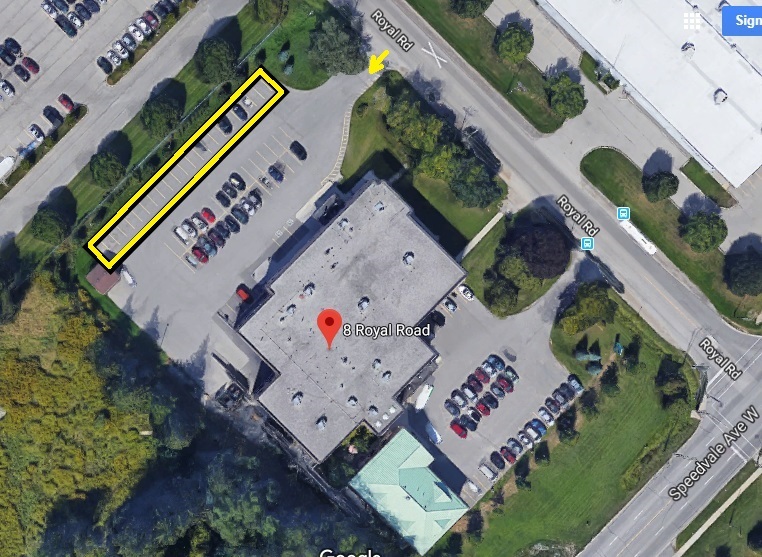 The spaces are available at the Carpet Store across the street and behind the auto parts store north of the club. To view the location of these spaces, please click here. There are also 23 parking spaces at Community Living Guelph, 8 Royal Road, just 1.1 kilometres from the Club. These spaces are available for car pooling. To see a map of the parking spaces available at this site for our members, please click here. The spaces are at the north end of the lot and are outlined in black on the map. Congratulations to all the club members who did well in the 2018 masterpoint races. Details are available here. To register for ridesharing to the Guelph Bridge Club, please click here. As people register, information will be available in the members' area of the website. For information on Youth Bridge, please click here. Details of the Winter 2019 courses are available here. The following motion was recently passed by the unit 249 board "Upon completion of a beginning series of bridge lessons which is their first bridge course, each person be given three free plays for a sanctioned club withing the unit." This applies for Beginner I courses after January 2019. Save the date Sat. May 11 for Barbara Seagram’s workshop at the club. Please note the new date. Details are available here. To register for Barbara Seagram's Workshop, please click here. To provide your emergency contact information, please click here. To read the current newsletter, please click here. To view the current newsletter as a pdf, please click here. The pairs open section will continue on Friday afternoon as long as there are at least 3 tables. There are no masterpoint restrictions for this section. Until the numbers are consistently over 3 tables we ask you to pre-register to play in this section either by signing at the Club or emailing Pat - pat.fung@sympatico.ca. We will hold the Friday session for an open team game as long as there are 4 pairs. Preregistration is still required. There is no longer a need to preregister for the Wednesday afternoon 299 game. We however ask that you come with a partner as we cannot guarantee a partner for the game.